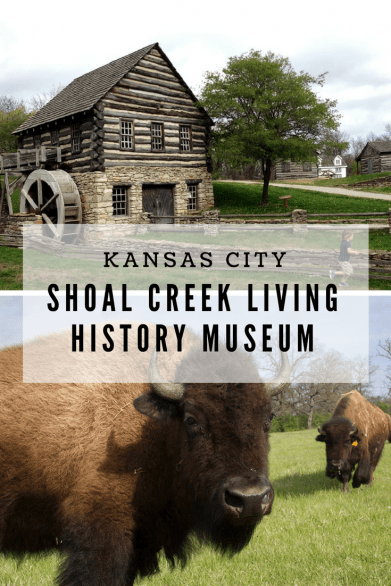 My family and I recently found a place in Kansas City that’s all about wide open spaces and a quiet stroll, and history mixed with nature: Shoal Creek Living History Museum. Shoal Creek Living History Museum is in Kansas City, Missouri. 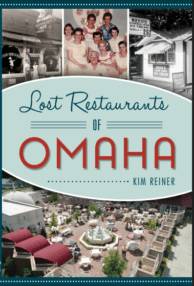 We visited this new-to-us place during a super fun weekend trip and it was a welcome change from the go-go-go adventures we’d had the day before at Worlds of Fun. Located on 80 acres within Hodge Park in Northern Kansas City, Shoal Creek Living History Museum is a FREE attractions takes families on a walk through Missouri’s past as told through architecture. Farley loved taking pictures of the buildings at Shoal Creek. I may be raising a mini blogger. Grab a brochure at the entrance to learn a bit more about the buildings on the grounds: There are 21 structures, 17 of which are authentic buildings dating from 1807-1885. Some of the more interesting structures included the Blacksmith barn built in the 1800s and was originally on a farm next to Hodge Park; the 1868 City Hall and Jail; and the 1880 Eldorado School. There’s also a carpenter shop, doctor’s office, church and several homes that I imagine are interesting to visit during re-enactment events. On a regular day, you won’t find any re-enactors at Shoal Creek Living History Museum. 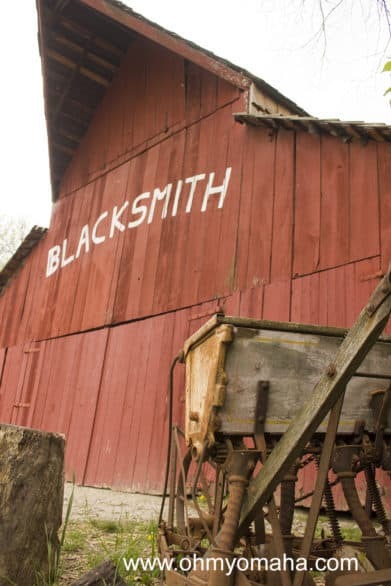 Plan to visit during a special event to see sites like the blacksmith barn come to life. Just a handful of people were there when we visited. Given the wide-open feel of it, it felt like we had the place to ourselves. I loved the space it provided for the kids to run, but even more so, I liked how relaxing it was. Shoal Creek Living History Museum is a photogenic place. My favorite building was the Grist Mill. It’s the first thing that caught my eye and it just stood out from the rest of the buildings. It’s actually the lone structure there that was built on site and is a replica of an 1824 mill. Figures. 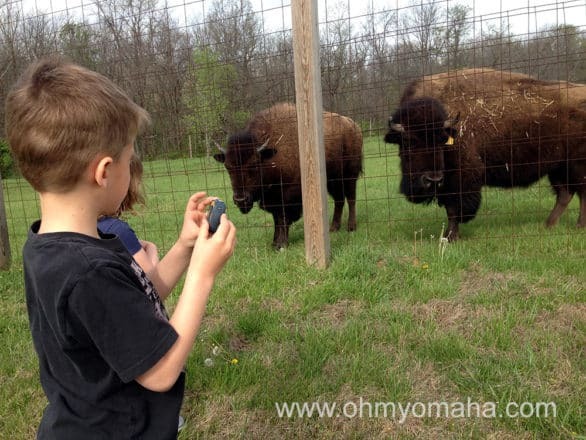 They loved the American Bison herd kept on the land. 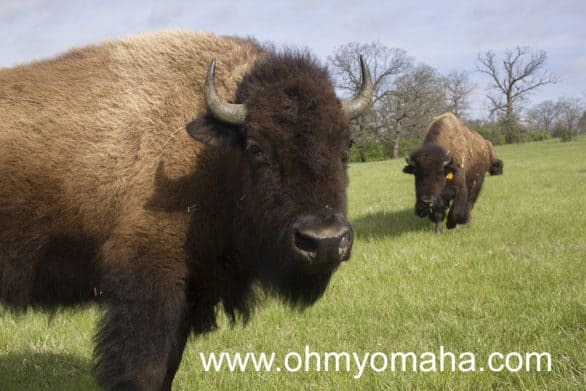 Bison at Shoal Creek Living History Museum in Kansas City. While they did seem pretty peaceful, one reminded us that they are still wild animals. It charged the fence. Even standing back a few feet from the fence didn’t feel like a good idea. Thank goodness for zoom lenses. The one on the right was headed our way. Perhaps a lesson learned here: Stand further back from the fence. American Bison herd at Shoal Creek Living History Museum in Kansas City, Missouri. On a given day, there isn’t programming in place, and you can only see the buildings from the outside. Re-enactors are at special events throughout the year at Shoal Creek Living History Museum, helping bring history to life for visiting families. But there are special events throughout the year where you may find re-enactors and perhaps enter some of the buildings. 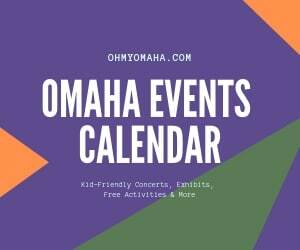 * Always check ahead of your visit to make sure an event is still happening. Things can be rescheduled! First Saturdays – June 2, July 7, Aug. 4 and Sept. 1, 10 a.m. to 3 p.m. FREE family fun event with re-enactors bring the village to life with skits and shootouts throughout the day, food and craft vendors, family activities and demonstrations, and shop at the mercantile. Some activities may charge for their services, cash only. 14 Annual Harvest Festival – October 14, 10 a.m. to 4 p.m. $5 per person, FREE for ages 5 and younger. Old-fashioned county fair with a puppet show, historical games, re-enactors, pony rides and more. $1 horse-drawn wagon rides from noon to 4 p.m. Kids Safe Halloween – October 27, noon to 3 p.m. FREE with donations accepted. Trick or treat event is for infants and elementary aged children. Wilderness Run – Nov. 3, 9 a.m. Choose between a 5-mile or 2-mile trail run. 22nd Annual Visit From St. Nicholas – Dec. 1, 10 a.m. to 4 p.m. $5 per person, FREE for ages 5 and younger. Homes will be decorated and e-enactors will bring 19th century Christmas to life. Take a brief horse drawn sleigh ride through the countryside from noon to 4 p.m.
Where: Located in Hodge Park at 7000 Northeast Barry Road, Kansas City, Mo. Cost: FREE to view the exterior of the buildings; buildings are open during special events with an admission fee or donation. We’ve been there. I was looking for something to do with kids, and this popped up. It’s a great place to go. My kids kept saying that it looked like Walnut Grove. I’m a Laura Ingall’s fan, and we own all the DVDs to the show. I bet your family enjoyed it! Did you guys go during an event or on a regular day?